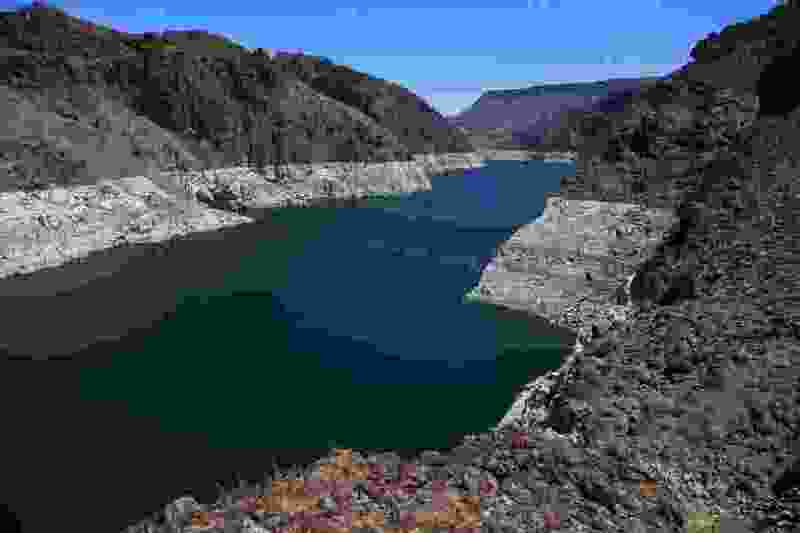 (Ross D. Franklin | The Associated Press) In this May 31, 2018, file photo, the low level of the water line is shown on the banks of the Colorado River in Hoover Dam, Ariz. Seven Southwestern U.S. states that depend on the overtaxed Colorado River say they have reached tentative agreements on managing the waterway amid an unprecedented drought. The plans announced Tuesday, Oct. 9 were a milestone for the river, which supports 40 million people and 6,300 square miles (16,300 square kilometers) of farmland in the U.S. and Mexico. The plans aren't designed to prevent a shortage, but they're intended to help manage and minimize the problems. Denver • Seven Southwestern U.S. states that depend on the overtaxed Colorado River have reached landmark agreements on how to manage the waterway amid an unprecedented drought, including a commitment by California to bear part of the burden before it is legally required to do so, officials said Tuesday.